Mick Jagger’s idea for The Rolling Stones Rock and Roll Circus was a non-traditional way to promote their new album Beggar’s Banquet. 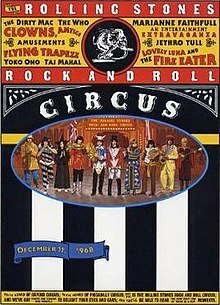 The concert featured of course The Rolling Stones but also- in order of appearance-Sir Robert Fossett’s Circus, Jethro Tull, The Who, Taj Mahal, Marianne Faithful, Danny Kamara – a fire-eater, a super group named The Dirty Mac which featured John Lennon, Eric Clapton, Keith Richards, Mitch Mitchell and Yoko Ono and The Stones. The concert was meant to be aired on the BBC but The Rolling Stones ended up withholding it. Speculation is it was withheld because The Who upstaged The Rolling Stones that evening. It would be the last appearance of founding member Brian Jones with The Rolling Stones. The film would not be available to the public until 1996. The Stones looked tired… I think they waited until last and it showed.